And the title changing continues with the Last Letters from Monte Rosa, a 2010 movie from Letters From the Dead director Ari Taub that is being released on UK DVD by Metrodome later this month under the more sentimentally inclined, research-bocking title, The Last Sacrifice. Set in Northern Italy during the last embers of the Second World War, the beleaguered vanguard of Axis forces, entrenched on an increasingly isolated position, suffer daily aerial bombings and the constant threat of attack from local partisans. Tempers flare between these uneasy allies, as their enemies threaten to overwhelm them and their impending fate looms over the devastated, war-torn horizon. "Compellingly directed, this explosive, action-packed war film combines the disparate stories revealed in the long lost letters of a desperate band of brothers fighting on the front line." 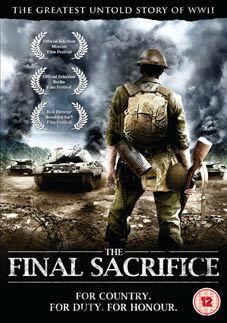 The Final Sacrifice, aka Last Letters from Monte Rosa, will be released on UK DVD on 24th January 2011 by Metrodome at the RRP of £15.99. There are no extra features on the disc.